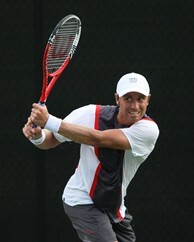 Steve Johnson won his first main draw ATP match on Monday night defeating Atlanta’s Donald Young, 6-3, 3-6, 6-3. 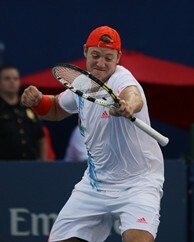 Johnson’s match didn’t end till almost 11 p.m. with the start time pushed back following an hour and a half rain delay during the late afternoon match between Jack Sock and Alex Bogomolov Jr.
Sock, 19, completed a 6-2, 4-6, 6-4 win over the No. 7 seeded Bogomolov Jr. and will next face his buddy and doubles partner, Johnson, in the second round. Bogomolov’s slump continued as he has now lost five straight matches and drops to a 9-21 on the season. Luxembourg’s Gilles Muller notched his 100th match win in singles action, firing 14 aces past Australian Marinko Matosevic for a 7-6 (5), 6-4 win. Muller, a former US Open quarterfinalist, improves to a 12-14 record this season and is slated to face two-time defending champion Mardy Fish in the second round. On Monday, the tournament honored the United States Military with a video montage and on-court appearances by a military Color Guard, national anthem singer Lauren-Ashley Blake and a Wounded Warrior, Sgt. Black. Stadium Court Starting at 4 p.m.
Ryan Harrison (6), U.S., vs. James Blake, U.S.
Grandstand Court Starting at 4 p.m.
Michael Russell, U.S. vs. Alex Kuznetsov (q), U.S.
Alex Bogomolov, Russia-Gilles Muller, Luxembourg, vs. Steve Johnson, U.S.-Jack Sock (wc), U.S.
Court 3 Starting at 6 p.m.